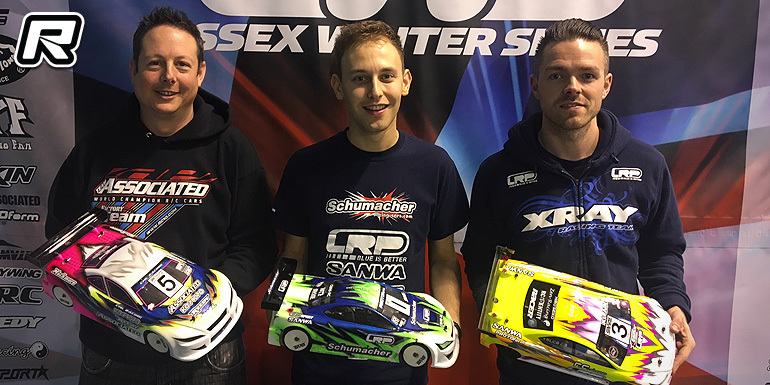 The third round of the Essex Winter Series championship took place this weekend. As the last major event of 2016, everyone wanted to end on a high, but also take the opportunity to stand out as a championship contender. In the Modified Class, Elliott Harper was heading the standings with two perfect scores from the two rounds so far. The first round of qualifying showed that his run of success was possibly about to end, after an incredibly close round saw Elliott only just snatching the fastest time on the final lap, pipping young Harley Eldridge to the top spot by three-hundredths of a second. Kyle Branson took third in the round ahead of Chris Grainger, but the top eight were covered by less than four seconds. Despite the close times, Elliott managed to just keep his Schumacher ahead of the pack, but with a gap of less than one second in most of the rounds. 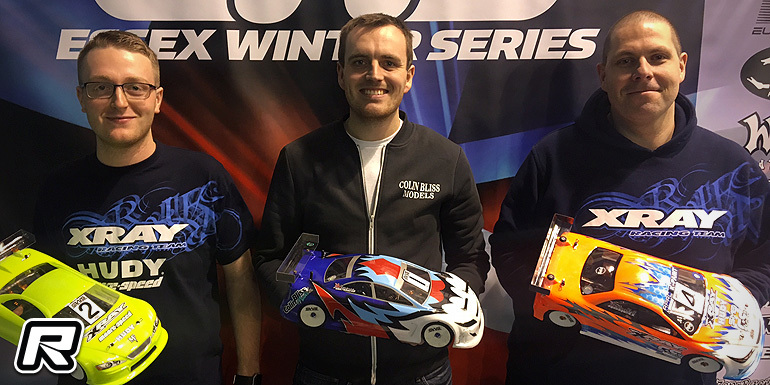 Harley demonstrated that Q1 wasn’t a one-off, setting consistently fast times with her new Yokomo BD8 to take two further second places, and secure the second place on the grid. Olly Jefferies got faster and faster throughout the rounds, securing third on the grid for Xray with a second place and brace of thirds. Infinity’s Kyle Branson would line up fourth, and Team Associated’s Chris Grainger wasn’t able to maintain his Q1 speed and had to settle for fifth overall. The A-final was a hotly contested race, with many trackside hoping to see young Harley in a position to secure her first major victory. However, a slight mistake from Harley on lap 2 saw her running wide and allowing Olly up to second. Olly was in no position to attack Elliott, however, as he spent the race then defending the position from Harley. But, despite having a clearly faster car, Harley wasn’t able to pass Olly, allowing the chasing pack to close up. As the two battled, Chris Grainger managed to nip through and move into second, pushing Olly to third and Harley to fourth, before Chris’ Associated team-mate Alan Bickerstaff also gained a spot on Harley. Out front, Elliott was never troubled and ran out to a very comfortable win and his third maximum points haul of the championship. Now knowing he will hold a points advantage going into the must-count fifth round, he moves a clear step closer to retaining the overall EWS title. The Super Stock Class saw a battle for pole position between the winners of R1 and R2 of the series, Tony Broad and Zak Finlay. Tony topped the first round, with Richard King taking second just in front of Zak. Zak then set the fastest time in Q2, in front of Tony, Richard and Marcus Askell. Tony was back on top in the third qualifier, ahead of Zak, Marcus and Ashley Wiffen, and Tony then secured overall TQ by taking the final round ahead of Zak and Marcus. At the start of the A-final, Richard made a small jump-start, and so dropped to the back of the pack at the first corner to avoid incurring any time penalty. This allowed a battle between Marcus, Ashley and R1 podium finisher Ricky Copsey to sort out third place, as Richard slowly worked his way back up the field. Out in front, Zak sat on the rear bumper of Tony’s car for the entire five minute run, never being quite close enough to make a real attempt at a pass, but also more than close enough that any small mistake or error from Tony would give Zak the lead. Tony soaked up the pressure, and ran out the winner to add to his R1 victory, and tie with points at the top of the championship table. 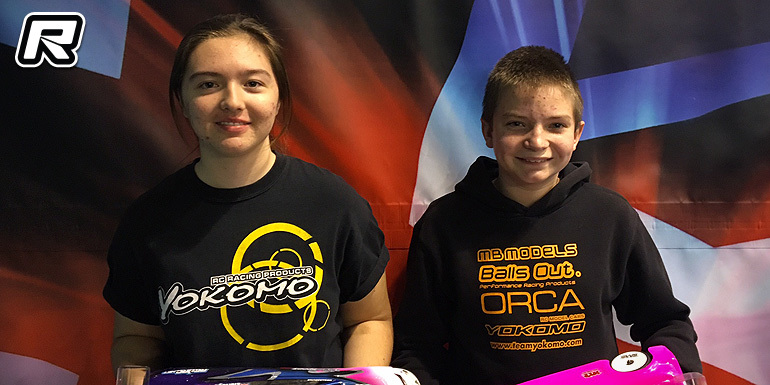 Finally, the top Juniors were Harley Eldridge for her stand-out performance in the Modified class, and Adam Southgate with a C-final placing in the Super Stock class. The series now takes a short break for Christmas, and returns on 22 January for the penultimate round of the series.